Why is exposing log brightly beneficial? I have been asked whether you should still expose log a bit brighter than the recommended base levels on the Sony PXW-FS5 now that Sony have released new firmware that gives it a slightly lower base ISO. In this article I take a look at why it might be a good idea to expose log (with any camera) a bit brighter than perhaps the manufacturer recommends. There are a couple of reasons to expose log nice and bright, not just noise. Exposing log brighter makes no difference to the dynamic range. That’s determined by the sensor and the gain point at which the sensor is working. 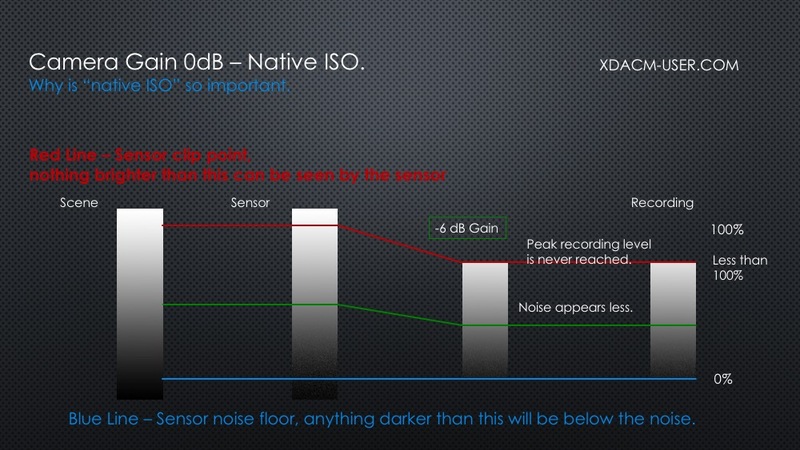 You want the camera to be at it’s native sensitivity or 0dB gain to get that maximum dynamic range. Exposing brighter or darker doesn’t change the dynamic range but it does move the mid point of the exposure range up and down. Exposing brighter increases the under exposure range but decreases the over exposure range. Exposing darker decreases the under exposure range but increases the over exposure range. Something that’s important when thinking about dynamic range and big dynamic ranges in particular is that dynamic range isn’t just about the highlights it’s also about the shadows, it isn’t just over exposure, it’s under exposure too, it’s RANGE. So why is a little bit of extra light often beneficial? You might call it “over exposure” but that’s not a term I like to use as it implies “too much exposure”. I prefer to use “brighter exposure”. 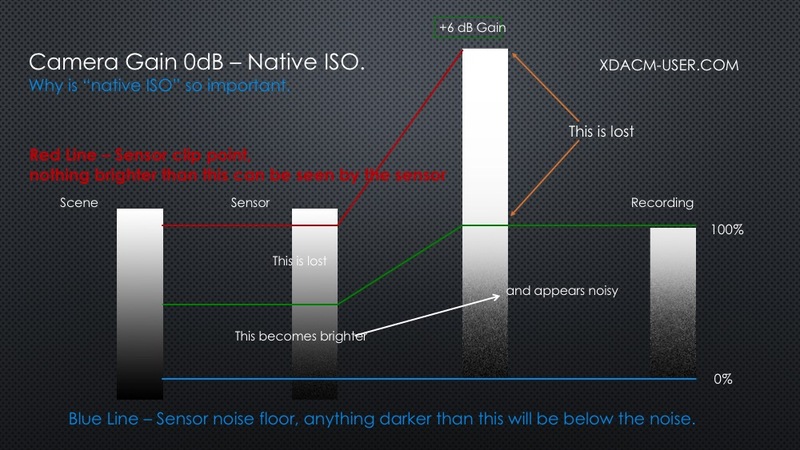 It’s actually quite simple, it’s about putting a bit more light on to the sensor. Most sensors perform better when you put a little extra light on them. One thing you can be absolutely sure of – if you don’t put enough light on the sensor you won’t get the best pictures. Put more light on to the sensor and the shadows come up out of the sensors noise floor. So you will see further into the shadows. I’ve had people comment that “why would I ever want to use the shadows, they are always noisy and grainy”? But that’s the whole point – expose a bit brighter and the shadows will be much less noisy, they will come up out of the noise. Expose 1 stop brighter and you halve the shadow noise (for the same shadows at the previous exposure). Shadows are are only ever noise ridden if you have under exposed them. This is particularly relevant in controlled lighting. Say you light a scene for 9 stops. 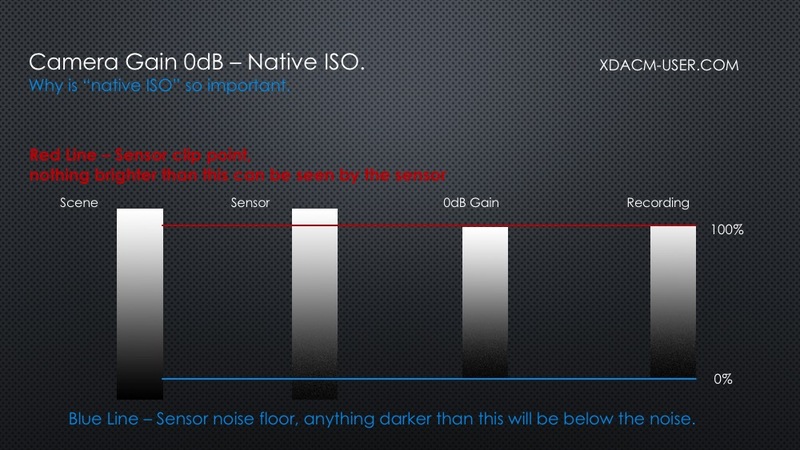 So you have 9 stops of dynamic range but a 14 stop sensor. Open up the aperture, put more light on the sensor, you get a better signal to noise ratio, less noisy shadows but no compromise of any type to the highlights because if the scene is 9 stops and you have 14 to play with, you can bring the exposure up by a couple of stops comfortably within the 14 stop capture range. Chart showing S-Log2 and S-Log3 plotted against f-stops and code values. Note how little data there is for each of the darker stops, the best data is above middle grey. Note that current sensor only go to +6 stops ove middle grey so S-Log2 and S-Log record to different peak levels. Look at the above diagram of Sony’s S-Log2 and S-Log3 curves. The vertical 0 line in the middle is middle grey. 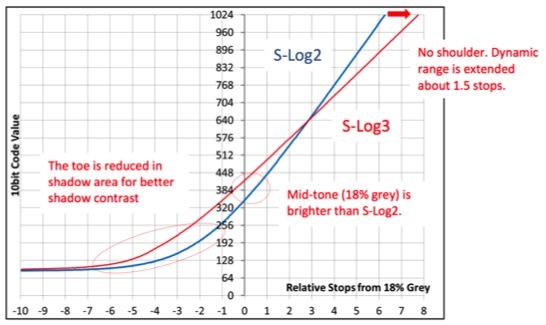 Note how above middle grey the log curves are more or less straight lines. That’s because above the nominal middle grey exposure level each stop is recorded with the same amount of data, this you get a straight line when you plot the curve against exposure stops. So that means that it makes very little difference where you expose the brighter parts of the image. Expose skin tones at stop + 1 or stop +3 and they will have a very similar amount of code values (I’m not considering the way dynamic range expands in the scene you shoot as you increase the light in the scene in this discussion). So it makes little difference whether you expose those skin tones at stop +1 or +3, after grading they will look the same. Looking at the S-Log curve plots again note what happens below the “0” middle grey line. The curves roll off into the shadows. Each stop you go down has less data than the one before, roughly half as much. This mimics the way the light in a real scene behaves, but it also means there is less data for each stop. This is one of the key reasons why you never, ever want to be under exposed as if you are underexposed you mid range ends up in this roll off and will lack data making it not only noisy but also hard to grade as it will lack contrast and tonal information. Open up by 1 additional stop and each of those darker stops is raised higher up the recording curve by one stop and every stop that was previously below middle grey doubles the amount of tonal values compared to before, so that’s 8 stops that will have 2x more data than before. This gives you a nice fat (lots of data) mid range that grades much better, not just because it has less noise but because you have a lot more data where you really need it – in the mid range. Note: Skin tones can cover a wide exposure range, but typically the mid point is around 1 to 1.5 stops above middle grey. In a high contrast lighting situation skin tones will start just under middle grey and extend to about 2 stops over. If you accidentally under expose by 1 stop or perhaps don’t have enough light for the correct exposure you will seriously degrade the quality of your skin tones as half of your skin tones will be well below middle grey and in the data roll-off. Now of course you do have to remember that if your scene does have a very large dynamic range opening up an extra stop might mean that some of the very brightest highlights might end up clipped. But I’d happily give up a couple of specular highlights for a richer more detailed mid range because when it comes to highlights – A: you can’t show them properly anyway because we don’t have 14 stop TV screens and B: because highlights are the least important part of our visual range. A further consideration when we think about the highlights is that with log there is no highlight roll-off. Most conventional gamma curves incorporate a highlight roll-off to help increase the highlight range. These traditional highlight roll-offs reduce the contrast in the highlights as the levels are squeezed together and as a result the highlights contain very little tonal information. So even after grading they never look good, no matter what you do. But log has no highlight roll-off. So even the very brightest stop, the one right on the edge of clipping contains just as much tonal information as each of the other brighter than middle grey stops. As a result there is an amazingly large amount of detail than can be pulled out of these very bright stops, much more than you would ever be able to pull from most conventional gammas. Compare log to standard gammas for a moment. Log has a shadow roll-off but no highlight roll-off. Most standard gammas have a strong highlight roll-off. Log is the opposite of standard gammas. With standard gammas, because of the highlight roll-off, we normally avoid over exposure because it doesn’t look good. With Log we need to avoid under exposure because of the shadow roll-off, it is the opposite to shooting with standard gammas. As a result I strongly recommend you never, ever under expose log. I normally like to shoot log between 1 and 2 stops brighter than the manufacturers base recommendation. Next week: Why is a Sony camera like the FS7,F5 800 ISO with standard gamma but 2000 ISO in log and how does that impact the image? Beware Exposing To The Right With Log. That may seem like quite a sensational headline – beware exposing to the right with log – but let me explain. First of all, I’m not saying you can’t or shouldn’t expose to the right, all I am saying is beware – understand the implications. First of all what is normally meant by exposing to the right? Well it’s a term that comes from the world of photography where you would use the cameras histogram to measure the exposure levels. Exposing to the right would normally mean setting the shutter speed and aperture so that the levels shown on the histogram are as far to the right as you can get them without going beyond the right side of the histogram. This would ensure a nice bright exposure with lots of light falling on the sensor, something that is normally highly desirable as you get a nice low noise picture once you have adjusted and processed it in your photo editing software. You can expose to the right with a video camera too. However when shooting with Rec-709 or conventional gammas this can often result in nasty looking highlights thanks to the default knee settings, so it’s not normally a good idea for 709 and standard gammas. With log or raw as there is no highlight roll off you can expose to the right and it should give you a nice bright exposure… or will it????? The problem with exposing to the right is that you are exposing for the highlights in the scene. If shooting a low contrast or low dynamic range scene this isn’t going to cause any problems as exposing to the right will mean that everything in the scene is nice and bright. But if shooting a high dynamic range scene, say an outdoor scene with bright clouds in the sky but large areas of shadow, the exposure will be optimised for the highlights. The mid range and shadows may end up too dark. On a sunny day if shooting a person with their back to the sun the sky could easily be 6 or 7 stops brighter than the skin tones. If you expose for the sky/highlights the skin tones will be 1 or 2 stops darker than the basic exposure level recommended for most log curves. (S-log2/3 has 14 stops. At the base exposure you have 6 stops above middle grey and 8 below. Skin tones are normally between 1 and 2 stops above middle grey. So if the sky/highlights are 6 stops above the skin tones, then exposing for the highlights will put the skin tones where middle grey should be, which is 1 stop under exposed and 2 stops below where I would normally like to see skin tones when shooting with log or raw). The first thing a viewer will notice when they look at a scene with faces or people will be the skin tones. If these have been under exposed they will be grainy and less than ideal. The viewer will notice noise and grain and poor shadows long before they look at the brightest highlights. Shooting log and protecting the highlights or exposing to the right will often compromise the all important mid tones because you are exposing for the highlights, not the midrange. In addition exposing for highlights with a high dynamic range scene can often push the shadows down in level and they will end up noisy and grainy. The biggest issue with exposing to the right is that it’s extremely difficult to estimate how many stops there are between your mid tones and the highlights, so you never know quite where your mid tones are falling. (Midtones – generally a white piece of paper or a 90% reflectivity white card would be considered to be the top end of the mid tones. Go down about 2.5 stops from white and you hit middle grey (18% grey card). This range between middle grey and white is where skin tones, plants, most animals etc will be and it probably the most important part of most images). An important consideration with log and raw is that there is no highlight roll off. Standard gammas (with the default knee found on almost every camera) , cinegammas, hypergammas etc all roll off the highlights. That is to say that as you approach the peak recording level the contrast is reduced as the highlights are squeezed together to try to extend the dynamic range. This reduction in contrast means that it is very difficult, if not impossible, to recover any nice, useable picture information out of anything close to the peak recording level. As a result with conventional gammas we tend to avoid over exposure at all costs as it looks nasty. This highlight roll off is one of the things that gives video the video look. Log and raw don’t have this same kind of highlight roll off. The image gets brighter and brighter until it clips. With log the stop immediately below clipping contains just as much picture information as any other stop brighter than middle grey. With linear raw the stop just below clipping has more information than any other stop. As a result in post production there is a very large amount of data that can be pulled out of these highlights, even if they are a little clipped! So don’t worry about a few clipped highlights when shooting log. The other thing to remember is there is no TV or monitor that can show these highlights as they really are, so they will never look perfect anyway. Another thing that happens when exposing to the right is that grading becomes harder than it needs to be. Because the separation between the mid tones and highlights will vary greatly depending on things like whether you are shooting into or away from the sun, when you expose to the right you mid tone brightness will be up and down all over the place. So in post production as well as adding the look that you want to your footage, you are also going to have to spend a lot of time matching the mid range exposure to balance skin tones etc from shot to shot. Rather than exposing to the right what I recommend is exposing for the mid range. After all this is the important part of the image. To do this you need to use a diffuse reflective shade. The most commonly used shades are a 90% white card and/or an 18% reflectivity grey card – middle grey. Get the mid range right and in most cases the highlights will take care of themselves. Getting the mid range right might mean exposing the mid range brighter than the recommended levels. But it’s the mid range we need to measure, not the highlights, this is the important part of the image. 90% white is an incredibly important level in the world of film and video. A typical piece of office paper reflects about 92-94% of the light falling on it. Office paper often uses brighteners and special chemicals to make it look bright and white. This white is the brightest diffuse surface you will likely ever see. Anything brighter than this is normally going to be an actual source of light. The sky perhaps or a direct bounced reflection off a shiny, reflective surface such as the bodywork of a car. So anything brighter than 90% white would normally be considered to be a highlight and to us humans, highlights are visually less important than the mid range. This is why the knee on most video cameras kicks in at around 90%. Anything brighter than 90% is a highlight so the knee only effects highlights and leaves the all important mid range alone. Middle grey is also very important because it’s a shade of grey that to most people looks to be half way between black and white. Skin tones fall roughly half way between middle grey and white. In addition if you average all the brightness levels within a typical scene the end result is typically very close to middle grey. Light meters are calibrated to middle grey. The relationship between middle grey and white is fixed. White reflects 90%, middle grey 18%, no matter how bright the actual light source. So whether you are indoors, outside. Whether it’s sunny or overcast, white and middle grey will always be close to 2.5 stops apart. They are extremely useful fixed reference levels. There are many ways to measure the brightness of a white or grey card. My preferred method is with a waveform display. But you could also use zebras (use a narrow zebra window if you can). You can also use false colour. Unfortunately it’s very difficult to use a histogram to measure the brightness of a specific target. The histogram is a great measuring tool for photography, but less than ideal for video. If you can’t get a white/grey card out in front of the camera you could consider using a light meter. It’s also worth noting that skin tones sit just a little over half way between middle grey and white, so if you have no other reference you could simply place your skin tones a touch brighter than half way between the values you are targetting for middle grey and white. Just to be clear: I do still recommend exposing Sony’s S-log2, S-log3 and raw between 1 and 2 stops brighter than the Sony base levels. But the key take-away is that it’s the mid range you need to measure and expose at this level. Exposing to the right using a histogram or waveform and just looking at the peaks and brightest parts of the image does not tell you what is happening in he mid range. Measure the mid range, not the peak brightness.